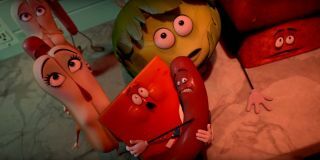 Sausage Party is the adult alternative to Pixar's family-friendly content. Sure, we've seen shelves of cheerful food items dreaming of a life beyond the supermarket in the recent green-band trailer, but make no mistake. This ain't for kids. Once those delicacies leave the grocery store for the Great Beyond, their lives take a brutal - and very funny - turn. This mix of parody and vulgarity with a dash of spoof is a unique beast, certainly, and will appeal to fans of Rogen's trademark brand of irreverent humor - me included. In light of Deadpool's R-rated success story, I expect Sausage Party will be cruising into multiplexes with hopes of achieving the same. Directed by Greg Tiernan & Conrad Vernon, and starring Seth Rogen, Kristen Wiig, Jonah Hill, Bill Hader, Michael Cera, James Franco, Paul Rudd, Salma Hayek, and Edward Norton, Sausage Party is scheduled to open in US theatres on August 12, 2016, before opening in UK cinemas on September 2, 2016.